Driving lesson then pub with ten members of my family for Sunday lunch and the match. I’m wearing a very relaxed Sunday outfit of old ripped boyfriend jeans from Trafaluc (Zara? 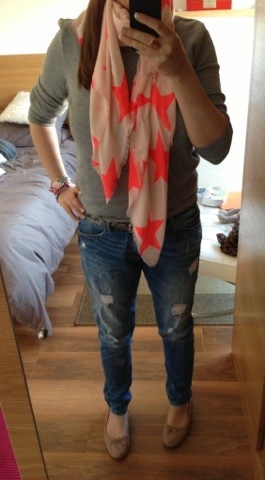 ), Gap grey sweatshirt, rose Sam Edelman studded Frankies, H&M neon star scarf. Will add grey Raybans and leather jacket to go out. 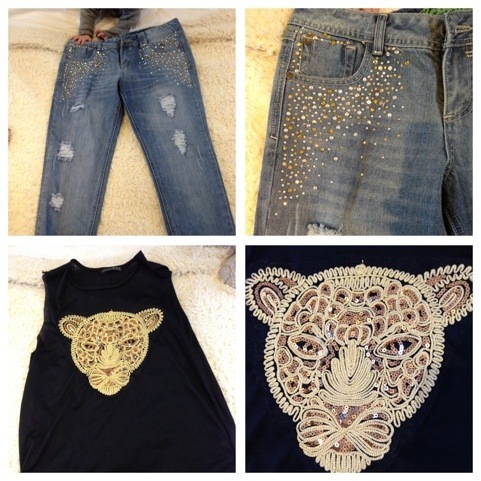 This entry was posted in Outfits and tagged Ash, Nudie, Primark, Uniqlo on March 2, 2013 by Eve WornOut. Today I Am Happy That.. ..I went to meet my friend Sarah WornOut. She has a personal blog about happy things. It makes me smile. We met in Grind in Westfield. 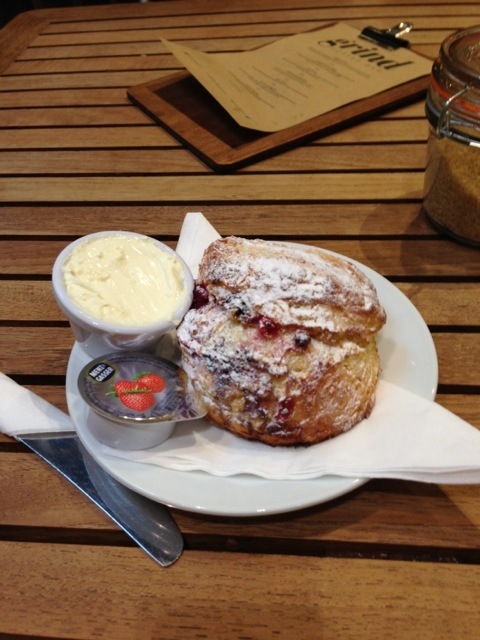 I cannot resist their berry scones. Who cares that I’m going to be in a bikini in a few weeks time when food tastes this good. I struggled with a top today. 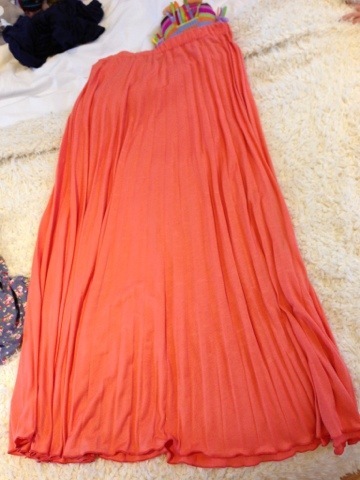 I need some more draping in my wardrobe I think. I had a look at All Saints but nothing tempted me. Please do let me know if you’ve seen a nice grey or black draped top, shirt even jumper anywhere. We did some light shopping and both bought some bejewelled Primark boyfriend jeans, I bought this beautiful no brainer black tshirt with a gold brocade tiger design and something about this pleated coral skirt was calling to me so it came home too. H&M had the nicest starry denim shirt in but the sizing was tiny. I’d need a 16 or 18 which they didn’t have. I bought a few bits for La Bambina in the Mothercare sale. She already has these Little Bird (Jules Oliver for Mothercare) trousers so I bought a bigger size with 50% off. Lovely colour and they wash well. 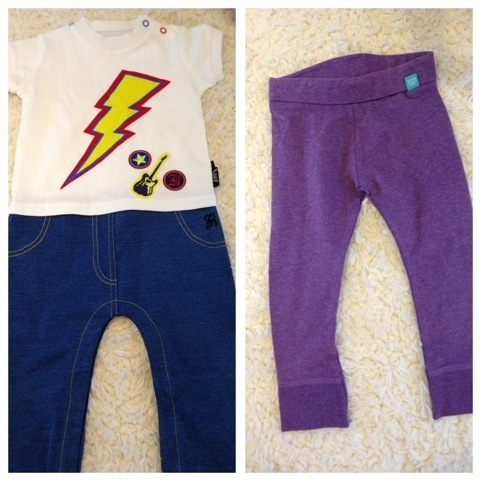 This lightening print in the Baby K range is great. This is actually a babygrow and a steal for £8. 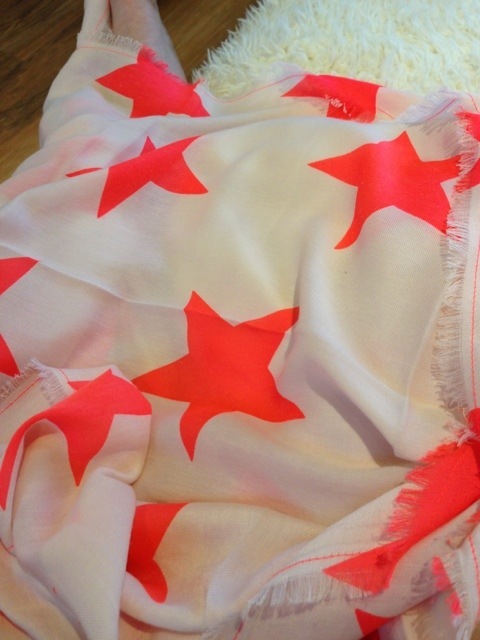 Lastly I bought this neon star scarf from H&M. A fitting ending to a lovely day with my friend Sarah. 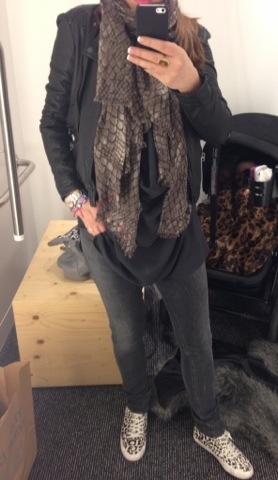 This entry was posted in Outfits and tagged All Saints, H&M, Mango, Marc by Marc Jacobs, Mothercare, Nudie, Primark, Uniqlo, Vero Moda, Zara on February 26, 2013 by Eve WornOut. As I mentioned in my last post, I am surrounding myself with love and friendship this week. We met one of my dearest mates and his wife for brunch this morning. It’s his 60th later this year so we had happy things to discuss. We are planning a trip back to Italy together to celebrate his birthday. It was nice to think of happy times and sunshine to come. I was planning to wear something other than skinnies and a jumper. However I failed dismally at getting my Little Legs to stay in bed and had to get up with her at 5:30am. Both kids woke each other up every hour all night too so I did not feel great this morning. It’s also freezing out. In the end I wore an ancient green Primark roll neck with Baukjen boxy Gemma on top, Zara olive skinny trousers, Ugg Gershwins, Zara parka, Marc by Marc Jabobs scarf, Carhartt bobble hat. It is very rare that we get both kids to nap together. Today we did and lordy, I needed it. I woke up feeling much better and went out to the pub for Sunday dinner wearing a grey draped shirt from Vero Moda many moons ago (how I would love to find a new version ), grey Zara heeled boots, Marc by Marc Jacobs scarf, black Nudies which I got from a friend a few years ago and my beautiful yellow Zara sunshine jacket from Sarah WornOut. Told you, surrounding myself with love and friendship, even in my clothes. This entry was posted in Outfits and tagged Baukjen, Carhartt, Marc by Marc Jacobs, Nudie, Primark, Ugg, Vero Moda, Zara on February 24, 2013 by Eve WornOut.